He was born in Tokyo in 1966. Given a drum set at the age 3 and taught music by his parents who loved music, he studied classical, jazz and African music. Due to his parents' job, in 1971 he moved to New York and after that to Nairobi, Kenya. He came back to Japan to enter primary school in 1974. After having made a sensational debut as a genius drummer at the age of nine, he has become a well-known person in the media. In 1977, he already had his first recital, Sketch Of Africa. And the following year when he had just become 11 years old, he released his first album, Virgin Voyage. 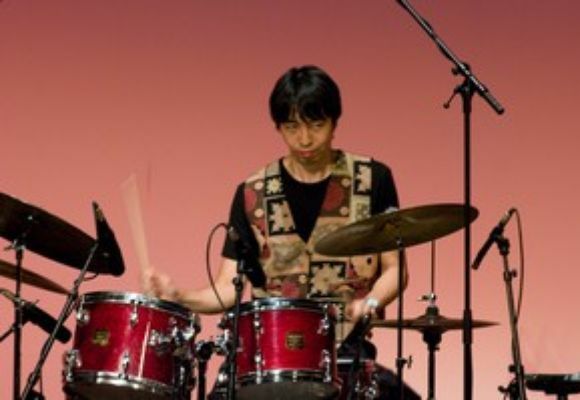 Entering junior high school, he worked with Toshihiko Honda (saxophonist) & the Burning Wave. During this period, he was active enough to participate in a lot of recordings including the Burning Wave and some drum sessions. Unfortunately, to complete his education in junior and senior high schools, he had to temporarily give up his professional musical activities. Entering Hosei University, he resumed his musical career by starting to play with Mikio Masuda (pianist) and continuously playing with Fumio Karashima (pianist) Trio, and the like. His resumption as a professional musician convinced the veteran drummers that this skillful drummer who was once considered to be a precocious musician had turned into one of the best young drummers and would become a drumming role model for the next generation. His impressive performances were when he accompanied Mikio Masuda (pianist) and Fumio Karashima (pianist). In their albums released in those days you can tell how skillfully he performed. In 1991, he moved from Tokyo to New York. While performing in sessions, he met Carlos Garnet (saxophonist) in Brooklyn and he became his regular member. He has joined them in three albums so far. in 1998. Now based in New York, he works with Continental Jazz Trio, Kenny Garrett (saxophonist), Tim Armacost (saxophonist), Mark Gross (saxophonist), Gerald Cannon (bassist), Yosuke Inoue (bassist), Fumio Karashima (basist), Duke Jordan (pianist) and so on. He is renowned for being an opinion leader in the Jazz field as well as a young talented jazz musician whose performance is an international level.